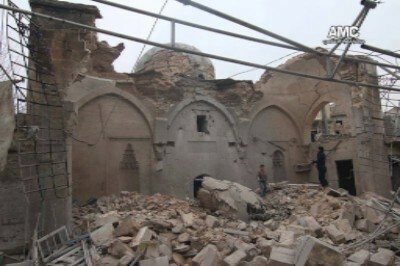 Images show the damage of Agha Jaq Mosque/Aghagak Mosque, dating back to the Ottoman era, in Qadi Askar/Qady Asker, Aleppo, resulting from air raids. See a collection of photos at Association for the Protection of Syrian Archaeology, January 12 2016 here and two additional photos posted at Syria Direct (January 13 2016) here. The DGAM reports on January 10 that looters are still active in the district of Quneitra, targeting Byzantine and Islamic-era sites. To read the update, see here. On January 13 2016 Retired Brig Gen Russell Howard discusses Daesh’s profiting from looted antiquities for The Cipher Brief here. The following two articles both contain some interesting, and sensible, fact-based analysis, and are worth reading for anyone interested in looted antiqutiies. There is also some interesting information and additional links in some of the comments. On January 12 the Gates of Nineveh blog asks just how much Daesh makes from the sale of looted artefacts here. On January 10 Judith Dobrzynksi responds to the recent NYT article on the way that Daesh makes money from looting, arguing that the dollar figures do not add up. See the discussion here. Prof. Máiréad Nic Craith talks about intangible cultural heritage for TEDx Talks (13.34mins) here. The DGAM announced on January 12 2016 that some of its staff have been receiving training on archaeological documentation in Beirut, sponsored by ICOMOS, CyArk, and UNESCO. For details, see here. The DGAM announced on January 19 2016 that monuments and structures in the Roman village of Bakirha, including the famous church there, are in good condition, due to serious protection efforts from the local community. See the report here. On January 18 2016, Irina Bokova, Director-General of UNESCO, says that it ‘is time to fight back’ against the destruction of cultural heritage here. The Antiquities Coalition has published an interactive map of threatened cultural heritage. See it here. Dr Donna Yates, of the Trafficking Culture projectn is offering a free on-line course on aniquities trafficking via FutureLearn, starting February 1st. For details, see here – sign up fast! The White House published a press brief on January 15 2016 addressing actions to counter Daesh, including dealing with sales of stolen antiquities. The brief can be found here. Dr Neil Brodie, world leader in antiquities trafficking, has begun a new blog covering looting and the illicit trade in stolen artefacts. See it here. The ASOR Cultural Heritage Initiatives project has published an index of its weekly reports. See here. The National Center for Policy Analysis considers Daesh’s trade in antiquities in a January 2016 brief by David Grantham. See here for a pdf of the detailed report, but be warned that the looting figures it contains on have been discredited as innacurate. The BBC’s “Partying for Palmyra” (January 22 2016) discusses the importance of heritage and efforts to protect it in Syria. DW.com has a short (2.31min) report on how German experts are helping to find looted artefacts from Syria and Iraq here. On January 12 Business Insider discusses looting, calling the current situation the ‘largest scale of mass destruction of cultural heritage since WWII’ here. On January 8 Euronews.com’s UTalk examines looting here. Zach Zorich for Nature on January 8 2016 looks at the widespread Syrian efforts to protect cultural heritage here.